For most of us, family history is a given. Our parents and grandparents will sit us down early in life and show us family photos whilst narrating memories as if they were fairy-tales. It’s those memories that later on become the foundation of our identity which we, in turn, pass on to our descendants. Even though our past doesn’t have to define us, it always does, one way or the other. It is that past that Christina Perestrelo (nee Rouvas-Stevens), a third generation Greek Australian, wishes to look into, for her own sake and her young daughter’s. Christina’s mother, Irene, passed away in 1963 when she was under 12 months of age, leaving behind her husband Emmanuel and her eldest daughter, then 12-year-old Maria. She took tablets to end her own life. Even though Christina grew up amongst relatives, be it her sister, her grandparents or her aunts, she was never able to ask the right -but pain inflicting- questions in order to know who her mother really was until recently. “Unfortunately I have very little personal information about my mother and would like to understand her a bit more,” Christina tells Neos Kosmos. She believes her mother worked in a haute-couture capacity for boutiques in Melbourne in the 1950s. Aside from her talent in pattern-making, her mum was also an avid piano player. “I am looking for other people in Melbourne that she may have known or worked with,” she adds, explaining that she does not have much hope about finding people that had spent time with her as they’d most likely be in their nineties if they are still alive. Christina and her older sister Maria were ushered to live with their uncle Don, his wife and three children, as their father – being a catering industry businessman and a “party-animal”- was incapable of taking care of an infant and a teen. A year later, things got too much and Maria and 2-year-old Christina were sent to their late mother’s parents in the Gold Coast. “I was too young to ask questions; I did not even know what I should be asking,” Christina says. Living with their grandparents, Christina vaguely remembers mainly quiet moments and did not have much of a childhood. Even though the lack of activity seemed to have bothered her at the time, in hindsight it was actually a good time, albeit short. While Maria being much older had moved out and taken life into her own hands, when Christina was ten, her grandfather died. Her grandmother died a year later. “My grandmother, was quite depressed; she did not have much energy,” she muses while her voice briefly breaks as she guides me through her family history. At the time, her sister, 24, was a teacher living and working in Adelaide. Maria had gotten married to her lecturer from university who was twice her age and was going through a rough divorce. Christina travelled there in her second hear of high-school and moved in. Apparently Maria, in search of the stability she never had kept making the wrong choices that burdened her fragile state even more. “She was amazing and artistic but troubled. “The year after I arrived she got sick and her mental health went downhill. I had to admit her to a psychiatric clinic. I was 16 at the time,” Christina says. From the age of 27 and onwards, “Maria’s life was a misery” as she was diagnosed with schizophrenia and spent her time in and out of psychiatric hospitals. At some point she got remarried and had two sons. Because her mental health was deteriorating, she left them and moved back to Adelaide where she lived alone in commissioned flats. During that time, Maria shared what she remembered with Christina who had started looking into their mother’s past. Like Maria, their mother Irene had mental health issues. She was institutionalised a couple of times. As Christina found out, her mother, who was based in Sydney when she gave birth to her had reached the point of divorce many times, but always kept to herself when it came to emotions. 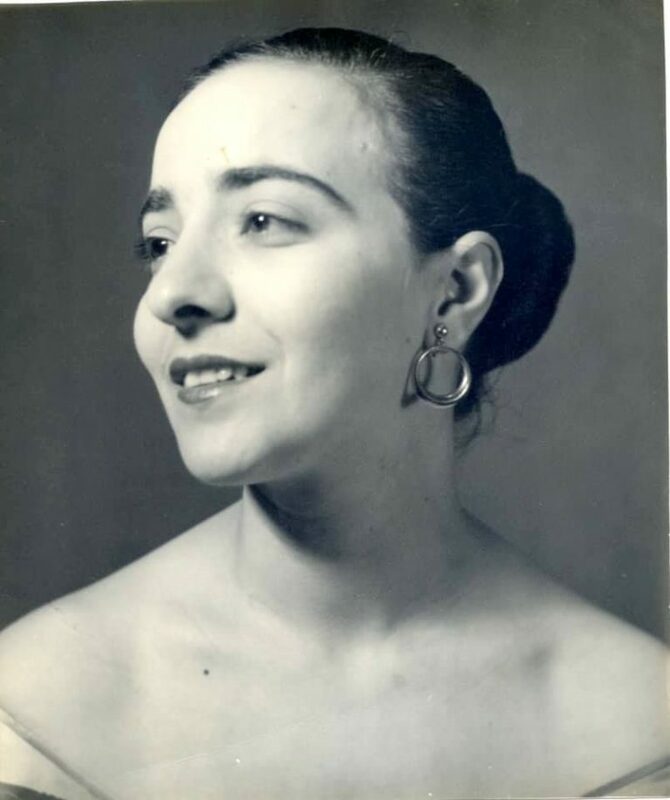 Born in Melbourne in 1927, Irene had three siblings, Despina, Joan and Dimitria. According to what her aunts told her, her mother was born in St. Kilda at the Ivanhurst Hospital and was extremely premature. Christina found out that her grandmother and her daughters were sent to Syros and then to Athens to receive Greek education in 1936. During that time, WWII broke out and the Eleftheriou-Stevens women were completely cut off and unable to get the money her grandfather was sending them. They struggled to survive and her mum’s older sister died of tuberculosis. “It wasn’t until 1946 when they finally managed to return to Australia.” Christina interrupts, “I don’t know if they were abused as they wouldn’t talk about it”. Christina, later in life tried to find records from their life in Athens without success. The next fragment of information she has about her mother’s life is when her parents had her sister Maria, in 1951, in Melbourne. “This is everything I know,” she stops.